C-section birth: When your husband’s friend sees it all. In two weeks, my husband’s friend will see my you-know-what-part-down-there… for the second time. I’m bracing myself for it. I’m looking forward to it. I’m scared of it. I’m embarrassed by it. I’m excited for it. In the name of a second C-section birth. The first time we did this party was about a year and a half ago: When I had to have a C-section after being a week past my due date, stalled labor after induction, and a baby’s heart rate that kept slowing down every time I moved. Yup, this was the time for a C-section. Fine. No problem here. Get the baby out safely for everyone. I remember laying on my back naked from the waist down, numb and shivering on an operating table, Hubby was holding my hand and his friend from medical school (who I’ll refer to as Buddy) busted into the cold operating room with the most boisterous “Heeeeey!” that I will never forget as long as I live… despite my drugged haze at the time. Buddy ran up to me, gave Hubby a man-hug and high-five, squeezed my nose, clapped his hands and asserted “Let’s do this” with a big smile on his face. Get happier, why dontcha? This is guy who we’ve sat around and drank wine and cocktails with. This is a guy who I tried to set up with a friend of mine once. This is a guy who’s got prime real estate in Beverly Hills. This is a smart guy, a fun guy, a nice guy, a good guy. And all I could think was that, from this point on, he would now know what my hoo-ha looked like up close. I felt like I was smack in the middle of an episode of Grey’s Anatomy. And then the laughing and high-fiving stopped and everyone got super-professional. I was having a C-section birth. Serious business, serious scenario (rightfully so). Since hospital regulations prevented my own Hubby from sewing me up – Buddy was my personal, Hubby-approved plastic surgeon enlisted to put me back together again. (No, not to tummy-tuck me right then and there… but rather to take advantage of a plastic surgeon’s stitch. Why not.) The way I saw it, Hubby worked his a$$ off in med school and this was a benefit we could take advantage of without extra cost. Together, we’d be looking at my little childbirth scar for the rest of our lives, and I was cool with having a refined stitch if I could. It’s like not having to pay for getting your car serviced because your husband is a mechanic. Months prior to when it was time for baby to be born, I nonchalantly agreed to Buddy sewing me up (what were the chances I’d actually need a C-section? ), but then I realized what I’d done when it came down to it on the day-of. Crap. Wait! He’s going to SEE ME DOWN THERE. No time to change my mind. And, nobody really listens to a slurring woman as she’s being wheeled into an operating room so that her baby can be pulled out of her body safely. Well, at least I’d be shaved. But would I ever be able to look Buddy in the eye again? Yes, I have. Yes, we’ve all had wine together since then. Nobody talks about my private parts. It actually turned out to be one of the most memorable, fun, funny, odd, special experiences in the history of my own life. Hubby and I respect Buddy even more for it now. The C-Section party’s proudly on again in two weeks with baby #2… and I’m lucky to have access to Hubby & Buddy’s smarts, skills and silly antics in the operating room, all modesty aside. BUT I ASK YOU: AM I CRAZY FOR SHOWING IT ALL FOR THE SAKE OF GOOD STITCHING? MEDICAL-MONDAY: Induction and my losing battle. 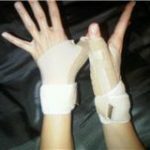 UNfabulous Thursday: In Tendonitis Hell? My “babies” are 10 and 6 years old, but I just have to tell you that I love your blog. Your stories just crack me up!